The crucial circumstance Sen. Lindsey Graham tweeted on Tuesday: “We are at war with…Islam and must act accordingly to protect our nation.” Regarding Trump’s travel restrictions, this is the most important thing to know. And it is quite foolish of Sotomayor, in her schoolmarmish concern about the president’s “anti-Muslim animus,” to discount the gravity of this. According to Sotomayor, Trump’s “policy now masquerades behind a facade of national-security concerns.” In other words, the purpose of the policy is to discriminate against Muslims, and the national-security stuff is just a pretext for that. Sotomayor’s interpretation here suggests that in order for the “national-security concerns” to be legitimate, it would have to be the case that Trump doesn’t have an “anti-Muslim animus.” For she is so focused on Trump’s offensive remarks that she seems unwilling to consider that his policy could be justified independent of them. But there are either legitimate “national-security concerns” or there are not; we either have adequate ways of vetting persons who want to come to our country or we do not: and in regard to all this, Trump’s “animus” or “hostility” is a sheer non sequitur. 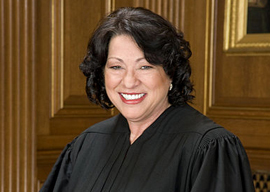 It would behoove Sotomayor to realize that, if the traveling restrictions seem to “target” majority-Muslim countries, the reason is that it’s Muslims who are trying to destroy the West as we know it and bring it under the rule of sharia law. And though the jihadists make up only a small proportion of Muslims, we don’t have some psychic power by which to distinguish “good Muslims” from “bad Muslims.” Hence the prudent travel restrictions, which inevitably affect many people who do not wish to harm us. This is a simple trade-off: Either we assign primacy to national security or we almost certainly admit terrorists into the country. This irrational perspective stems from what motivates so many people’s thinking: affect-driven delusion. In a democracy, it happens inexorably over time that these persons vastly preponderate the minority of people who perceive clearly and think well. So, whether it’s the southern border or travel restrictions, we find that where democracy needs citizens to take an unflinching look at their common problems and make judgments accordingly, what they often do is assert opinions about the phantasmal world they want to inhabit, the actual world being too painful, too tragic.